Open this box and join the storytellers of old. 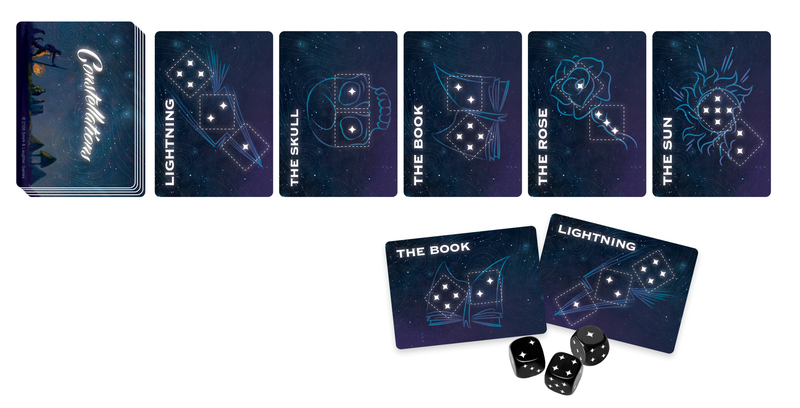 Before there were Stars is a storytelling game where each player tells the mythic creation story of ‘their people.’ Featuring star-pipped dice that are rolled to form the ‘night sky,’ one scans the stars for constellations to use as keywords for the story. Inspired by Constellation cards, players craft tales about the creation of the world, the origins of civilization, the rise of their great hero, and an end of days. Points are awarded for best story moments, allowing everyone to shine, regardless of their skill as a storyteller. This ‘feel-good’ game lets players appreciate the boundless imagination in all of us. Perfect for couples, wine parties and game nights, with high quality components that feel appropriate for the evening. Colony – Bézier Games, Inc. Previous story Preorder Grackles Now!